As we reported yesterday, Palestinian Authority president Mahmoud Abbas says that he will resign as PA president if Israel resumes building West Bank settlements, which would cause the collapse of the Mideast peace talks between the Israelis and the Palestinians. Abbas has been indicating for several months that he would like to step down because of his age. However, the implications of his resignation go much farther. The PA leadership have agreed that no other senior official in the PA (Fatah) organization would take his place, and no new election would be held. This means that the Palestinian Authority would be dissolved, according to Haaretz. The dissolution of the PA would also mean that the Palestinian security forces would be dismantled, leaving the West Bank with no police force. The Palestinians would then demand that responsibility for security in the West Bank be taken over by Israel or by the United Nations. Another option is that the United Nations Security Council and General Assembly will simply recognize a Palestinian state, just as it recognized an Israeli state in 1948. Chief Palestinian negotiator Saeb Erekat is quoted by Ynet as saying, "Should [the talks] fail, we'll consider turning to the UN to check the possibility of imposing an international mandate on the territories." Thus, it's quite possible that the Mideast will look very different in a couple of months than it does today. That Abbas, at age 75, would like to step down as Palestinian President is no surprise, as he's been indicating a desire to do so for several months. In an August radio interview, translated by Memri, Abbas expressed a great deal of sadness that peace had not been achieved, and said that he would not run for another term as Palestinian president: "I cannot go on ruling, and I need to rest; I'm at the age where I can't continue to lead." Born in 1935, Abbas was part of a generation that grew up during World War II and then during the genocidal war between Jews and Arabs that followed the partitioning of Palestine in 1948 and the creation of the state of Israel. Like people in America's Silent Generation, that grew up during WW II, Abbas and people in his generation have spent their lives working to prevent anything like that mass slaughter from happening again. His sadness stems from the fact that he sees the same xenophobia growing between Arabs and Jews that he saw as a child. In May, 2003, in "Mideast Roadmap - Will it bring peace?" I wrote that there was incredible irony going on in the Mideast, in that the leaders of two opposing sides, Ariel Sharon and Yassir Arafat, hated each other, but that they're the ones cooperating with each other (consciously or not) to prevent a major Mideast conflagration. As long as those two men were in charge of the Israelis and the Palestinians, respectively, nothing like the 1940s war would happen again. But the disappearance of these two men, especially Arafat, would be part of an overall generational change that would lead to a major new conflagration within a few years. This was certainly not the common wisdom at the time, and several people wrote to me saying that when Arafat died, the Mideast would become more peaceful and President Bush's Mideast Roadmap to Peace would be adopted. Well, Yasser Araft died in November 2004, and Ariel Sharon fell into a coma in January 2006. Six months later, in July 2006, Israel went to war with Hizbollah in Lebanon, something which, I believe, would never have happened if Sharon had still been in charge. Abbas is part of the Palestinian "Old Guard" generation that formed Fatah and led the Palestinians in the years after the 1948 war. 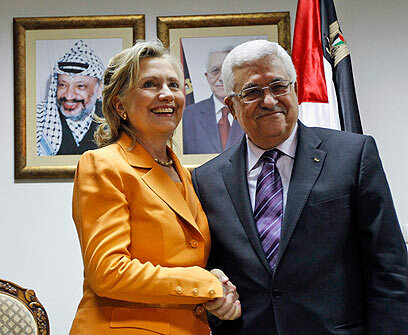 Since the 1990s, Abbas has been considered to be a conciliator. He was a leader in the Oslo peace process in 1993, and was involved in several attempts at peace since then, often recommending a more conciliatory approach than Arafat wanted. He became Palestinian president after Arafat's death, raising worldwide hopes that Mideast peace was at hand. The "Young Guard" generation, corresponding to America's Boomers and Generation-X, formed the Hamas organization in the 1980s, with the objective of eliminating Israel completely. Although they went along with Arafat, they never respected Abbas, and in February 2007, took control of Gaza after a bloody war between Fatah and Hamas. Two years later, in January 2009, it was Israel's turn to fight Hamas, in a war that ended inconclusively with Hamas still in control of Gaza. Abbas has been criticized in the Arab community for refusing to condemn Israel for the Gaza war. No major war has been fought in the West Bank territory since Abbas became Palestinian president, and it can quite reasonably be argued that this is because of Abbas's leadership. It's worth remembering that neither Fatah (Abbas) nor Hamas are in control of the future. 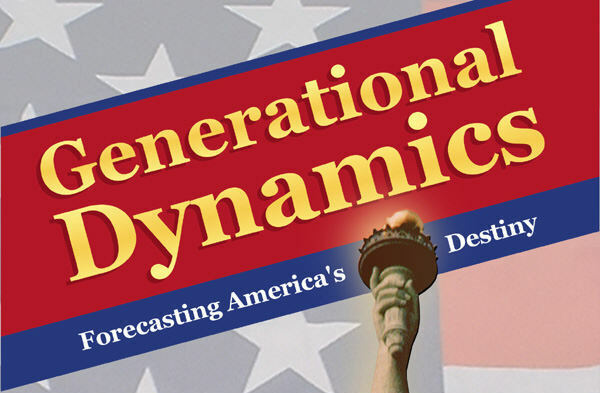 The future belongs to the younger generations, born since the 1980s, with no sense of history. In Gaza, the median age is 17, meaning that Gaza is being run by kids under age 30 running around with guns and missiles. And a poll of young Israelis, quoted by the Palestine Chronicle, indicated that they didn't even know what continent Israel was on. These are the generations that are going to decide the Mideast's future. None of them wants to listen to the babblings of old fogies like Abbas and Netanyahu, and that's why even if a peace agreement could be forged in a meeting room in Cairo, it would be worthless. From the point of view of Generational Dynamics, Arabs and Israelis are headed for a new genocidal war, re-fighting the 1948 war that followed the partitioning of Palestine and the creation of Israel. Many leaders in the international community understand this viscerally, and that's why they're applying so much pressure to keep the peace talks going, at any cost, for as long as possible. However, the peace talks must collapse, sooner or later, and the resignation of Mahmoud Abbas will bring a dramatic generational change in leadership that will put younger people in control, with calamitous results. Like all international meetings these days, the meeting of the International Monetary Fund (IMF) ended inconclusively with no agreement on currency and trade issues, according to the Irish Times. The article quotes Dominique Strauss-Kahn, the IMF�s managing director, describing the impotence of the meeting's final communique: "The language is ineffective. The language is not going to change things ... There is no way to believe that global growth can be rebalanced without changing some currency value. ... What we need is real action." However, according to an analysis by Reuters, "real action" is taking place in the form of increased protectionism by several countries. In fact, the situation is made worse by Friday's disastrous jobs report. Investors are convinced that the Fed will implement more qunatitative easing. As a result, investors have been selling dollars, and going after emerging markets, leading to a weakening of the US dollar. However, everyone wants a weak currency, so that their exports will improve, and so Japan, China, Brazil, and Europe are all taking steps to weaken their own currencies. The article quotes Thailand's finance minister as saying, "That there seems to be lack of agreement as to what needs to be done at the global level with the major economies is of concern to us. There seems to be a race to the bottom...and that's very problematic." In 2005, Lebanon's prime minister Rafik Hariri was assassinated as described in the February, 2005, report, "Massive Beirut explosion killing Rafiq Hariri puts Lebanon into state of shock." Now, reports indicate that Lebanese people are arming themselves because they're terrified about the prospect of a new civil war between Hizbollah and its allies on the one hand, and Lebanese Prime Minister Saad Hariri and his supporters on the other, according to Haaretz. Saad Hariri is the son of the slain Rafiq Hariri. The fear is that violence will be triggered by a new report on the assassination, prepared by a special international prosecutor, because it's expected that the report will lead to the indictment of some Hizbollah leaders. The tension is made worse because of a planned visit to Lebanon next week by Iranian president Mahmoud Ahmadinejad. Ahmadinejad is Hizbollah's main supporter, and has supplied money and weapons to the terrorist organization. However, from the point of view of Generational Dynamics, Lebanon is in a generational Awakening era, as I've written many times, and so a civil war is impossible or, if one begins, it will fizzle quickly.